In the United States today, one in 100 adults is incarcerated—a six-fold increase in the last three decades. The number of individuals providing prison ministry, meanwhile, is declining—the population of caregivers is aging, and funding is diminishing. These were among the facts considered at the day-long program “‘You Visited Me’: The Urgent Challenge of Prison Ministry,” held October 29 in the Heights Room. 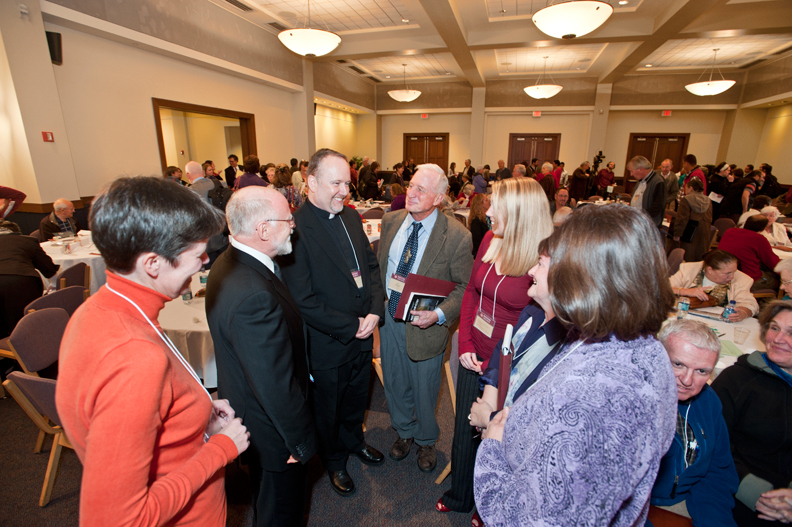 More than 200 prison chaplains, students, community volunteers, and criminal justice professionals gathered to hear talks by practitioners such as Suzanne Jabro, CSJ, director of the Center for Restorative Justice Works in North Hollywood, California, and Maureen Clark, CSJ, Catholic Chaplain at the Massachusetts Correction Institute in Framingham. The event’s sponsors included the University’s School of Theology and Ministry, the Church in the 21st Century Center, and Jesuit Prison Ministries. Pictured above, from left, are Elke D’Haeyer, a master’s student in pastoral ministry; Stefan Deschrijver ’10, who holds a licentiate in sacred theology; George Williams, SJ, chaplain at San Quentin State Prison in California and a visiting professor, who teaches a class in “Foundations of Prison Ministry”; theology professor John McDargh; Elyse Wagner, a master’s student in pastoral ministry; Maureen Clark; and Deborah Grondin (back to camera), a student in Williams’s class. This feature was posted on Wednesday, November 3, 2010 and is filed under Featured Photo.